FFA - San Antonio Human Resources Management Association eliminates CAIR from seminar entitled Understanding Islam in the Workplace. 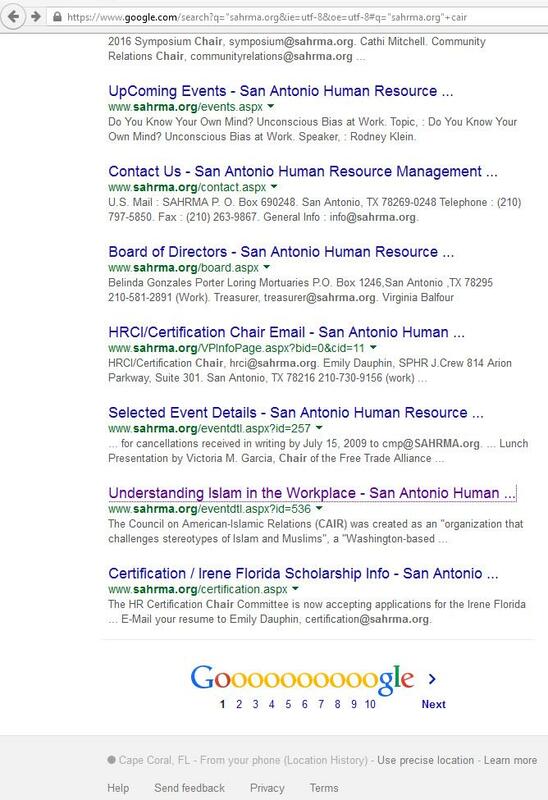 Florida Family Association sent out an email alert on May 4, 2015 entitled San Antonio Human Resources Management Association sponsors CAIR seminar for educational certification credit entitled Understanding Islam in the Workplace. The email alert asked Floridafamily.org subscribers to send emails that urged San Antonio Human Resources Management Association officers and board members to abandon CAIR’s curriculum. Thousands of people sent emails. The San Antonio Human Resources Management Association (SAHRMA) quickly dropped CAIR from making the workshop presentation scheduled for May 12, 2015. The SAHRMA website provided the following description of the new speaker: The website NOW provides the following description of the new speaker: Rodney Klein graduated from the University of Texas at San Antonio, and was hired by the U.S. Equal Employment Opportunity Commission as an Investigator in 1992. Mr. Klein investigated individual complaints of employment discrimination, along with large class and systemic cases. He worked as a liaison between the EEOC and various fair employment practice agencies. And, he was the San Antonio Office’s Charge Receipt Supervisor, responsible for receiving and processing all incoming discrimination complaints. Currently, Mr. Klein is the Dallas District’s Outreach and Training Manager. He speaks to audiences about employment related matters, the civil rights statutes, and EEOC procedures, and he is a featured speaker at his office’s yearly training seminars for employers. Florida Family Association did not copy the web page before SAHRMA changed the speaker for the class. However, a Google search the morning of May 6, 2015 still contained part of the CAIR description in cache as shown in the photograph at the bottom of this email alert below. The Cache may change to the new description shown above for this Google search https://www.google.com/search?q=%22sahrma.org&ie=utf-8&oe=utf-8#q=%22sahrma.org%22+cair but at the time it was photographed the morning of May 6, 2015 the Google search cache stated: "The Council on American-Islamic Relations (CAIR) was created as an "organization that challenges stereotypes of Islam and Muslims", a "Washington-based ..."
Thankfully, it appears that SAHRMA has eliminated CAIR from teaching this course. Emails of concern clearly made a difference in SAHRMA's quick removal of CAIR from teaching the course. Florida Family Association responded to the change of speaker by sending emails to inquire with SAHRMA’s top officers and directors if CAIR would have any other involvement in the course. None of the San Antonio Human Resources Management Association (SAHRMA) officials responded to Florida Family Association's inquiry. Florida Family Association hopes to receive a report from insider(s) about the course presentation.